Graduate from the Midwest Culinary Institute (MCI) at Cincinnati State in 2015, Kinsey has an Associates in Applied Business, major being Culinary Arts Technology. 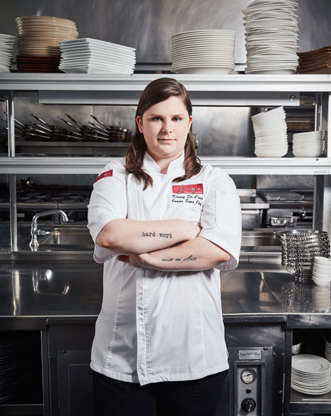 In 2012, Kinsey started at Jag's working in pantry, she swiftly worked her way to raw bar and cooking saute to Junior Sous Chef in 2016. A year later she was promoted to Sous Chef. Her passion is working on new innovative dishes and new menu development. Kinsey enjoys working with the younger culinary students, encouraging them to work hard and reach for their goals. She and her husband, who is also a chef, share the love and respect for food and how it brings friends and family together.